SDR13.5 Fire Sprinkler Pipe, Orange Lightweight CPVC Rigid Pipe. Length is plus or minus 1/8". To buy more than one size, pick the length you want, and click on the add to cart button. Then click the back button, change the length, and click on the add to cart button again. 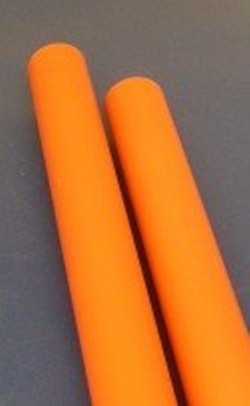 It should add both sizes of the orange PVC pipe to your cart. Yes, there is printing on this CPVC sprinkler pipe. Orange color is a flat medium color. Please note: UPS adds a surcharge for all packages over 4' long. So it's cheaper to ship several smaller pieces than it is one long piece. There are no cancellations or returns on cut pipe or hose so please be sure you are ordering the correct size and length.. The price you see is the price per foot on the custom length pipe. Thank you.